A report by a Blanchardstown policing forum says that the problem of drug users being intimidated is a national issue. A stash of drugs and money. FOR EVERY EURO spent on intervening in intimidation of those who owe money to drug dealers, a further €10 can be saved. 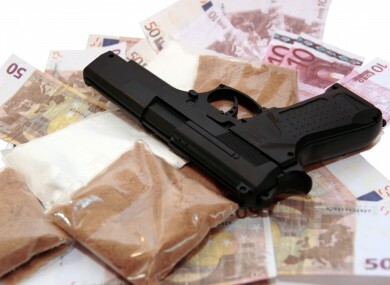 That is the finding of a new study into the subject of drug debt intimidation by Safer Blanchardstown, the policing forum in the West Dublin suburb. The report also says that intimidation relating to drug debts can be “mild, severe or ruthless”, and often leaves communities feeling “helpless, isolated and in fear”. The report breaks down the stages of intimidation into three stages: lower order, middle order and higher order. Although the ages in each stage are not fixed, ‘lower order’ intimidation mainly involves those aged between eight and 16, and can include behaviours such as bullying, vandalism and graffiti. So-called ‘middle order’ behaviours include drug debt intimidation and burglary, involving those aged between 13 and 20. Meanwhile, the ‘higher order’ stage tends to involve those aged 17 and over, engaged in behaviours such as gun crime and drug gang activity. Philip Jennings is the report’s author and co-ordinator of Safer Blanchardstown and says that the problem is a national one. “Drugs and drug debt intimidation are not just Dublin-wide issues, they have harmful effects on communities in every corner of Ireland and in every country across the globe. “We must start to look at drug debt intimidation as a behaviour that develops, like any behaviour, along a continuum. If we see these behaviours as occurring at different stages but having an interconnected affect between higher and lower orders, linked interventions could be developed to tackle particular behaviours. This will have the overall affect of reducing the number of individuals, and the attraction to become, involved in anti-social behaviour, drugs misuse, drug related crime and drug debt intimidation. The report calls for an inter-agency strategy to be adopted at local level, saying that money could be saved with earlier interventions. Email “"Systematic and co-ordinated" response needed to tackle drug debt intimidation - report”. Feedback on “"Systematic and co-ordinated" response needed to tackle drug debt intimidation - report”.